Reference number for this case: Oct-54-Creil. Thank you for including this reference number in any correspondence with me regarding this case. It was a railwayman disguised with a can, impermeable suit and a green lamp. The station of Creil saw the other evening its warehouses become the theatre of the most beautiful panic which proceeded there by memory of railwayman. One of them, indeed, a lampmaker, George Olivier, to make a good joke to his comrades, had disguised as a flying saucer pilot. Having cut a sort of houppelande in an old nylon raincoat, equipped with a helmet made in an old oil can bored of three holes, equipped with a flashlight whose bulb was painted in green, and two antennas, George Olivier penetrated in the hangars. The appearance in the night of this phantasmagoric being with the phosphorescent eyes produced an amazing effect. Railwaymen, frozen on the spot for a short while, found their courage and started to chase the gnomet. Catch it, shouted a conductor which had taken the direction of the operations, there is a newspaper which gives a premium of one million. When he was about to be circles, the Martian run around wildly, rushed at its prosecutors, utterring shouts and using the famous paralysing green ray. However, the score of prosecutors had enough forces to start a mad retreat to the station where they immediately held a war mission briefing. They were preparing a new tactic when George Olivier, without his disguize, joined them. "Did you not see the Martian?" he asked his colleagues. "Yes I saw it, I even touched it," answered Olivier. "And you did not take capture it?" "No, since the Martian, it was me." And the prankster, bursting into laughters, enjoyed a long moment the astonishment and the disappointment of his comrades. The heads of department of the merrylamp maker of the S.N.C.F. have, it appears, ambiguously appreciated the joke. But George Olivier had taken care to indulge in this prank before the normal hour of his duty. Mr. Lucien Lejeune, mayor of Chateauneuf-du-Pape, has just taken the following decree which was approved by the prefect of Vaucluse and was made executory yesterday. 1. The overflight, the landing and the takeoff of aircraft known as flying saucers or flying cigars of whatever nationality are prohibited on the territory of the community. 2. Any aircraft, known as flying saucer or flying cigar which will land on the territory of the community, will be immediately put in jail. 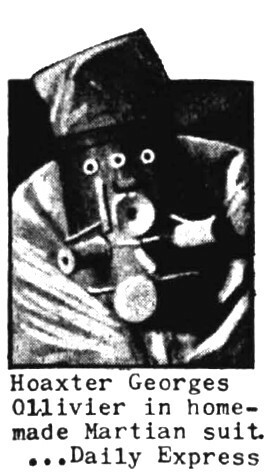 A French railway worker, George [sic] Ollivier [sic], of Criel [sic], made himself a home-made Martian suit (See illustration), using an oil can for a helmet on top of which he had mounted a green light. The weird outfit frightened people so greatly that it was reported Criel was in the hands of the Martians. Michel Carrouges explains that in Creil, in Oise, a railwayman manufactured a mask with old cans, various additions amon which an electric bulb painted in green. He then showed himself onr evening popping out of the corner of the station and frightened his colleagues railwaymen by lighting his false green ray. He rushed towards them while uttering shrieking vocals. While people fled, he took advantage to quit his disguise in discretion so that he managed to get his laughs from the effects of his practical joke. Michel Carrouges offerred this case in his chapter devoted to the hoaxes inspired by the 1954 UFO flap, indicating that it is in the newspaper France-Soir of October 29, 1954 that the story of this hoax was published for the benefit of the public. One of the most significant hoaxes had as authors two journalists who narrated their joke in Samedi-Soir. One night in October 1954, dressed in diving suits and armed with fireworks and other devices, they "landed" five times near the road along a Brive-Cahors-Montauban-Toulouse-Graulhet route. Several people testified seeing "beings" armed with ray guns. "I perfectly saw a saucer like a big red ball, a witness said. Out came two 90 centimeters tall beings. The Martians ran to the saucer that flew under our noses like a big rocket." In the same month of the same year (we were in a period of a great wave of saucers), a railwayman of Creil made a mask with a fake can and painted the bulb of a flashlight in green. One night after his duty, he appeared at the station and lit his "green ray." His comrades were petrified. The next day, they told him the terrible apparition. However, no doubt that if one had investigated the observers of the journalists-divers or the railroad green ray, we would have concluded in the sincerity and perfect balance of the witnesses. It was a prank by a railwayman, E. Zurcher p. 176. M. George Ollivier, a French railroad worker who lived in the town of Criel, made a "spaceman costume" out of odds and ends. Although crude, the result managed to scare the socks off many of his neighbors. "Creil in october 1954 (date not specified) "green ray", which is supposed to be in a book by Carrouges (Les apparitions de Martiens p163) according to an old letter by M. Figuet." The website indicates that on 29 October 1954 in Creil, France, there was a "Close encounter with a an unidentified craft and its occupants. An unidentifiable object and its occupants were observed at close range." The source is indicated as Carrouges, Michel, Les Apparitions de Martiens, Fayard, Paris, 1963. Hoax, known as hoax in the first place. [---] Article in the national newspaper France-Soir, Paris, France, October 29, 1954. 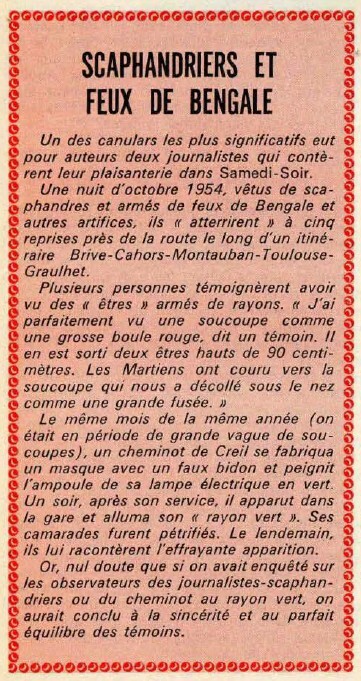 [qh1] Article in the regional newspaper Le Quotidien de la Haute-Loire, France, October 30, 1954. [gb2] "Troubled European Skies, article by Gray Barker, in his flying saucers magazine The Saucerian, Gray Barker editor, USA, Vol. 3, No 2, page 23, Spring 1955. [mc1] "Les Apparitions de Martiens", book by Michel Carrouges (aka Louis Couturier), Fayard publisher, France, page 163, 1963. [---] "Encyclopédie des Farces et Attrapes et des Mystifications", book by François Caradec, Noël Arnaud publisher, France, page 335, 1964. [---] "Les Apparitions d'Humanoïdes", book by Eric Zurcher, Alain Lefeuvre publisher, France, page 176, 1975. [hi1] "Scaphandriers et Feux de Bengale" unsigned article, in the History magazine Historia, France, Special Issue, #46, page 98, 1976. [em1] Post by Eric Maillot, archives.liste-aleph.org/ml/aleph-200311/msg00008.html, 2003. 0.1 Patrick Gross January 29, 2006 First published. 1.0 Patrick Gross March 1, 2010 Conversion from HTML to XHTML Strict. First formal version. Addition [ud1]. 1.1 Patrick Gross April 5, 2010 Addition [mf1]. 1.2 Patrick Gross September 25, 2014 Addition [hi1]. 2.1 Patrick Gross December 8, 2016 Additions [gb2], [ub1]. 2.2 Patrick Gross December 12, 2016 Addition [lg1].